Michigan State University’s football team finished 2013 undefeated in Big Ten Play and won the 2014 Rose Bowl. Its new North End Zone Complex not only celebrates the team’s previous success, but also looks toward future victories with a state-of-the-art recruiting center. The new facility features about 16,000 square feet of tile, set with TEC® products. Comprising 50,000 square feet in two levels, the new North End Zone Complex is an inspiring home base for the Spartans. The locker room alone measures 5,000 square feet, with two 500-square-foot shower areas. 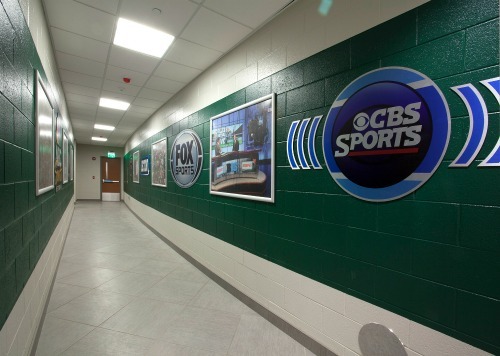 The renovated space also features a prominent recruiting center for all MSU athletic teams, support spaces, media rooms, concession areas and additional restrooms. The addition hosts hard-working athletes – and hard-working tile. 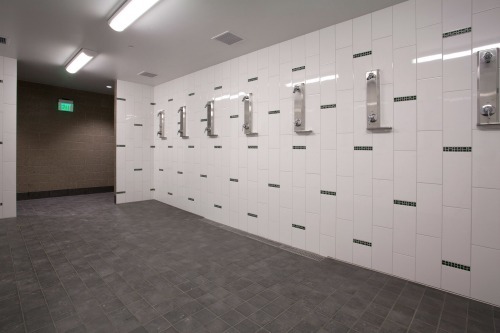 To make sure the tile performed at its best in a variety of spaces – including the locker room’s showers – installer Artisan Tile, Brighton, MI, consulted with TEC® technical sales professionals. A TEC® representative worked with Artisan Tile to help them select an array of products suited for the demanding environment. Artisan Tile used TEC® HydraFlex™ Waterproofing Crack Isolation Membrane to protect the installation from potential moisture damage. As moisture levels change, subfloors, adhesives and tile can expand, contract and even crack. 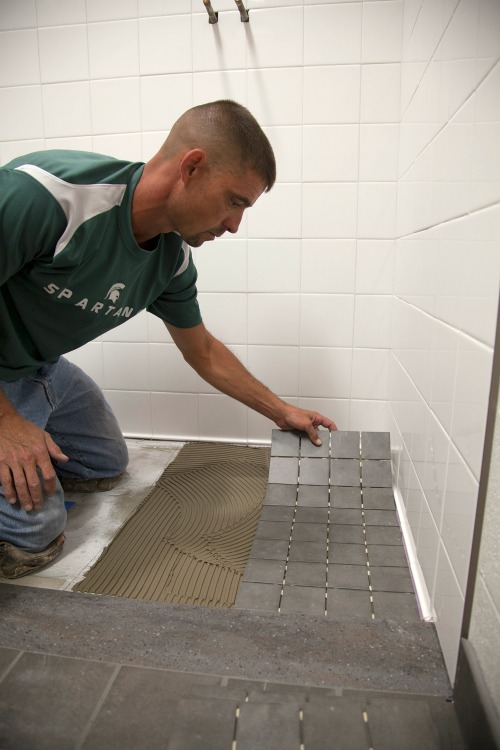 At Spartan Stadium, HydraFlex™ helps stop in-plane cracks at the subfloor from telegraphing through to the tile. HydraFlex™ dries in just two to three hours, which kept this installation on schedule to ensure the locker room was ready for football season. In the shower areas, HydraFlex™ also provides waterproofing. It resists mold and mildew, helping to provide a place for MSU athletes to cool down on game days. Tile can be bonded directly to HydraFlex™ using a suitable TEC® latex-modified mortar. Artisan used Full Flex® Premium Thin Set Mortar to place 6-by-6 and 3-by-3 inch tiles on the shower floors. The walls feature Spartan-green glass tile, which was adhered with Super Flex™ Ultra-Premium Thin Set Mortar. The green is complemented by white 8-by-20 inch white tiles, set with TEC® Ultimate Large Tile Mortar. The TEC® products worked together to create shower areas with lots of school spirit. The recruiting center, which will be used to recruit student-athletes for every MSU sport, also features a variety of types and sizes of tile. Future Spartans walk into the recruitment center on porcelain wood-look tile, installed with TEC® Full Flex®. TEC® Ultimate Large Tile Mortar, in a 3/4-inch mortar bed, adheres large-format limestone tile to the walls. The floor and wall tiles create a welcoming, yet elegant, space that reflects MSU’s commitment to its student-athletes. In high-traffic corridors essential for other trades, Artisan Tile relied on Quik Flex® Accelerated Thin Set Mortar. This mortar is ready for grout in just 3 hours, which kept the installation on track and helped ensure that all contractors could reach their work areas without disturbing the tile. Ordering setting materials for a project with such a wide array of tile types and sizes can be complicated. To simplify the process, Artisan Tile used the free TEC™ Installation Systems Coverage Calculator App. This app estimates the amount of surface preparation products, mortars and grouts necessary for a project based on square footage, tile size and size of grout joint. "I love using the TEC iPhone App. The Coverage Calculator helps me plan, particularly for projects like this one – with tile of all types and sizes,” says Panning. “It was very accurate, so it made the ordering process easier." TEC® InColor™ Advanced Performance Grout, in Light Pewter, Bright White, Light Smoke and DeLorean Gray, was used with all of the many tile types in the North End Zone Complex. Specifically formulated for heavy commercial use, TEC® InColor™ met both the aesthetic and performance requirements of this hard-working space. The $24.5 million renovation was completed in August 2014.